This review will be different from any others I have done so far as I am reviewing a meal experience that you cook yourself. For full disclosure, I am not a customer nor do I have anything invested in the company. We received a meal package by Hello Fresh from our friend H. For those not familiar with Hello Fresh apparently it is a service that has dinner packages delivered on a weekly basis to your home. The packages include fresh ingredients with cooking instructions tailored to your preferences. 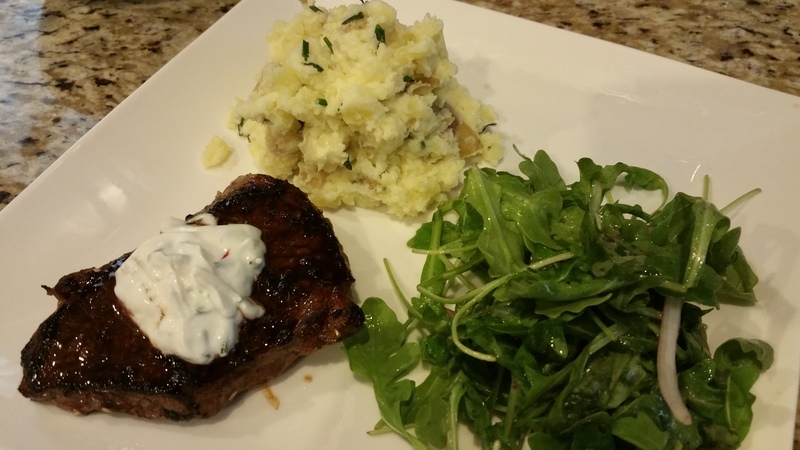 I cooked ‘coffee-Dukkha rubbed steak with smash potatoes and chive cream sauce’ for two. It also included the makings for an arugula with shallots side salad. All the main ingredients were included already in the portions required. The only additional ingredients I had to have on hand were oil, butter, and white sugar. The ingredients were indeed fresh, as promised, and of good quality. The instructions were clear, although I do think the prep time is a bit underestimated, at ten minutes. I am admittedly no chef, but I think there is a fair amount of multitasking that would have to take place to actually achieve ten minutes prep and 30 minutes total cooking time. Allergens are also clearly marked. Although what would be even more helpful is to include suggestions if one needed to substitute. For example, the Dukkah spice had tree nuts and sesame in it, but if I had an allergy and did not include the spice, I am not an experienced enough cook to have an idea of what I could use as a substitute. I also didn’t know if the coffee/sugar mixture could have stood well on its own without the spice mix. I also found that I used quite a lot of kitchen equipment (read: lots of post-cooking clean up). If strictly following the instructions, one would need to use thirteen pieces of cooking equipment, not including some obvious tools such as knives and forks for prep and tongs for cooking. One thing I cannot comment on is price nor delivery, as I mentioned I received the dinner from H. Overall, the meal delivered both in appearance and taste according to my other half, and the bonus is now I have the recipe to remake whenever I wish to buy the ingredients. PreviousNever again to martial law! NextPaano huminga sa ilalim ng lupa?